Smoothviews has featured many outstanding musicians from the DMV – District/MD/VA Metro area. There seems to be no shortage of talent from this mid-Atlantic region. 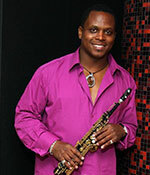 June’s OTS brings us back to the area to introduce you to saxophonist Brian Lenair. Brian Lenair grew up in the metropolitan DC area. Because his father was also a saxophone player, music was part of his life from early on. One could argue that it was hereditary, and that making music was pre-destined for him. His father was one of his earliest and strongest musical influences, but there were others along the way, both personal and professional, including a JHS teacher, and the music of Grover Washington, Jr. and Stanley Turrentine. Brian’s style is a blend of R&B, funk, and jazz with a little of the DC home grown “go-go” thrown in as well. As he got older, he began to take music lessons in school. That lead to a more serious interest in music and he eventually began playing on the local DC music scene. Brian’s first band was called 4-1/2 Hours. After working with that band for a period of time, he fronted another band, Spur of the Moment. Spur was an R&B/Jazz band and they grew in popularity throughout the DC metro region. Brian stayed with Spur for 15 years before he made the decision to leave and concentrate on becoming a solo artist. Brian easily transitioned to the next phase of his career. He has released four CD’s as a solo artist. The first one titled, The Journey, released in 2004. That was followed in 2006 with Inspirations Vol. 1, which shares Brian’s strong spiritual side. There was a holiday release in 2009 entitled A Saxy Christmas. His last and latest CD, Eye of the Storm, was released in 2010. Eye of the Storm is packed with contemporary R&B jams and classic smooth jazz sax playing. Brian is very popular in the DC area, but his talent is being recognized on the national scene as well. He played with Marcus Johnson at the 2013 Berks Jazz Festival in Reading, PA. That was followed by the 2013 Seabreeze Jazz Festival in Panama City, FL. He has also played previous years at the Capital Jazz Festival in Columbia, MD, and aboard the Capital Jazz Super Cruise. His resume includes touring and/or playing with George Benson, Al Jarreau, Peabo Bryson, Will Downing, Jean Carne, and Grover Washington, Jr.
Brian is an avid cyclist, and when he’s not making music, there’s a good chance he’ll be riding somewhere. He is not only a musician; he composes and produces as well. It’s necessary to wear many hats in this industry and he wears all of them well. Brian continues to play regularly both in the DC area and across the country. Look for him in the DMV or at a jazz festival near you.